Be the first to share your favorite memory, photo or story of C. Michael. This memorial page is dedicated for family, friends and future generations to celebrate the life of their loved one. 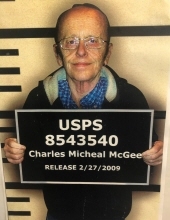 Charles Michael Magee passed away in his home as he slept on January 25, 2019, after prolonged illness. Mike was born July 24, 1946 to Bonnie and Charles Magee in Muncie, KS. He attended Stony Point South Elementary, and graduated from Turner High School, Turner, Kansas. On March 25, 1968 he met Ruth Marie (Rusty) Miller and after a whirl wind courtship they were married on May 25, 1968; and remained married to the day of his passing. May 25, 20019 they renewed their vows in San Jose, Costa Rica. Surrounded by longtime extended family members, they were married in a little Methodist Church, followed by a second honeymoon traveling the beautiful country. In 1986 they adopted four-year-old Nicholas Scott Magee. He was the light of their lives. Mike coached little league and doted on is son. Mike loved sports; he loved watching the Royals, Chiefs and basketball. He loved spending a Saturday watching collage games. However, his true game of choice was bowling. Mike started bowling down on Kansas Avenue at the old Muncie Bowl when he was seven. The whole family excelled at bowling, he carried over 190 average, and qualified twice to bowl in the Pro-Am. Mike bowled in many leagues including Senior Leagues Strivers Sr. Scratch Classic Olathe, KS and Postal Leagues, where his postal team won a silver medal in Kansas City’s Corporate Challenge. Mike also assisted our brother-in-law Bob Hall coaching our nephew’s baseball games. Later on, he coached a boy’s sixth grade basketball team at Blessed Sacrament School, coming in second place. He also loved playing golf. He especially loved playing with his best friend Bill Allison. Although, I don’t think either one of them ever broke 100. Nevertheless, they loved the comradery of each others company. He loved any games that had to do with a ball, no matter how big or how small the ball. Many hours we spent playing cards with friends, Connie and Mike, Connie, Bob and Marge, Jim and Max. Often playing till the wee hours of the morning followed by breakfast. Mike is preceded in death by his parents Charles and Bonnie; in-laws Harold and Marie Miller, brother in-law Dale Pugh, nephew David Pugh and brother in-law Joe Devine. He is survived by his wife of 50 years, Ruthie (Rusty), daughter Julie (Tim) creek, Grandchildren: Tim Jr. (Chandlar), Shannon, Megan, Kelsie, Hanna and Wyatt Creek. Two great grandchildren, Paisley and Cooper Creek, son Nicholas Scott, daughter in-laws; Krystal McKim and Ruth Ginefra, Grandsons; Tyler Magee, Lucian Mendoza, and Jackson Devine and grand daughter Livia Rose Magee. One sister; Connie (Bob) Hall, and one brother; Guillermo Miranda, sister in-law Cindy Devine, brother in-law Del (Kay) Roberts and many nieces and nephews to whom we both adore. The family wishes to express their sincere gratitude to Ascend Hospice Nurse Lisa House and Chaplain Harold Dwight, dear Connie Allison and sister Cindy Devin, sister and brother in-law Connie and Bob Hall for all their help, and for the many prayers and condolences from our extended family and friends. To send flowers or a remembrance gift to the family of C. Michael "Mike" Magee, please visit our Tribute Store. "Email Address" would like to share the life celebration of C. Michael "Mike" Magee. Click on the "link" to go to share a favorite memory or leave a condolence message for the family.